I swear, I must be either really tired, really jet lagged or just plain worn out- but it took me 30 minutes to get dressed this morning. I stood in my closet and stared at my clothes for 30 minutes. Seriously! I don’t know what was wrong, but I simply couldn’t put together an outfit. Often when this happens, I’ll just reach for an old stand by- but since I’m trying to show different looks each day, I didn’t want to bore anyone with an outfit you’ve seen recently, so this is the best I could do. I did warn you all yesterday that I’m a simple dresser… I didn’t lie! Part of my problem is that I’m going to Costco today, and really wanted to wear something comfortable. 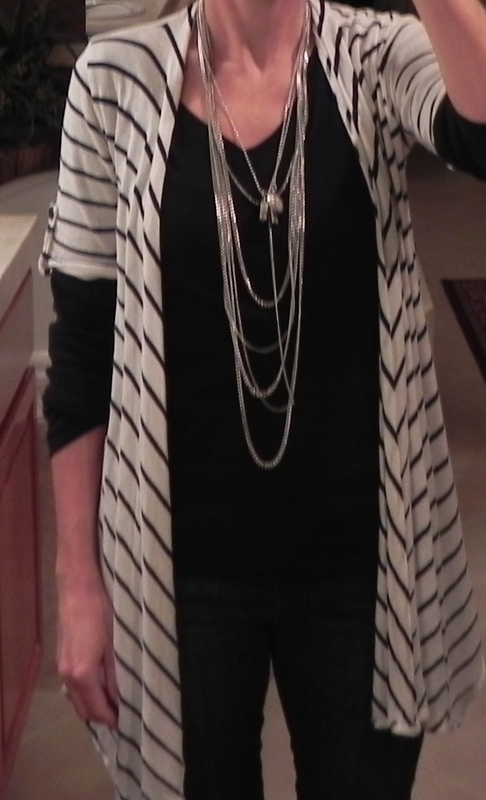 I decided to go with skinny blue jeans (they look black in this picture, but they are actually blue), a black v neck shirt and then I added this cute striped open cardigan. On the right you can see the outfit without the cardigan. This used to be my sister Erin’s daily look. It’s simple, easy and slimming, but it’s also boring. Why not throw on a little cardigan to add some interest? To finish it off (and follow my rule of 3), add a necklace. In this case, a long necklace is needed to help draw the eye down. The long necklaces help break up the solid black of the t shirt.